Acquiring high LTV users is a big challenge, and retaining and keeping them engaged is yet another. In fact, many apps are failing to maintain user interests and keep them interested for a long duration. Which has led to the increased use of retargeting strategies by many app marketers. Retargeting campaigns are designed to bring back lapsed users who have stopped interacting with an app over a period of time by driving them to re-install the app or complete post-install actions. The concept of retargeting is simple: the ad redirects the user to the app store if they uninstalled the app, or launches the app if not uninstalled. Advertisers create user lists internally or via DMPs and share them with Aarki. Aarki has run retargeting campaigns using a variety of ad formats, including native, video, interactive, playable, and interstitial. Leveraging proprietary machine learning algorithms, we conduct analyses of how the users engage with an ad. 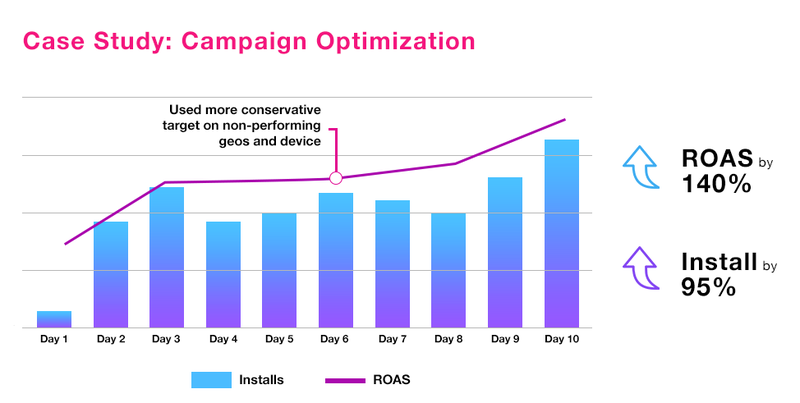 This enables us to consistently deliver strong app marketing performance based on the app marketers’ retargeting goals. By leveraging the latest generation of Aarki machine learning models to manage the CPM bid, Aarki is able to optimize on KPIs like CPC, CPI, and ROAS. The advertiser launched a relatively new game. The goal of the campaign was to keep the users, who had downloaded and played the game, active. As this was a newer title, we did not have a lot of historical player data to drive a retargeting strategy and pre-train our bidding models. We had a very general retargeting list, which required a different approach. At the initial phase of the campaign, we maximized the geos and ran the ads globally. Campaign managers were hands-on in optimizing the campaign, tracking the daily performance and analyzing historical data. As a result, we identified the top performing audiences and increased targets for them. By bidding more aggressively in core countries, we were able to drive up ROAS and the install volume: ROAS increased by ~140% over the last 10 days while volume of installs increased by 95%. At Aarki, we understand that the combination of powerful machine learning algorithms and strong campaign management leads to app marketing success, especially when you don’t have much information about your target audience.